The US Army Corps of Engineers is refusing to authorize the resumption of the construction of the $3.8 billion Dakota Access Pipeline. Further to that, the Corps reiterated its request to the company to “voluntarily stop work” on private land in the area. 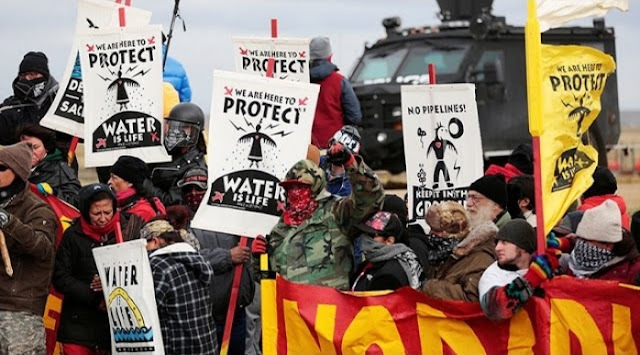 The North Dakota protest site at the reservation of the Standing Rock Sioux has grown into “the largest gathering of Native Americans in more than 100 years,” reports the BBC. The protectors, who have gathered together from multiple tribes, and other supporting the cause, say they are taking a stand for future generations against the four-state Dakota Access Pipeline Project. The Departments of Justice, the Interior, and Army issue a second joint statement, again refusing to authorize construction permits and requesting that ETP cease construction voluntarily. The tribe wrote in its lawsuit that it is concerned “with impacts to the habitat of wildlife species such as piping plovers, least tern, Dakota skipper, and pallid sturgeon, among others. The Tribe has a particular concern for bald eagles, which remain federally protected and play a significant role in the Tribe’s culture, and which would be adversely affected by the proposed pipeline. Responses to "US Army Corp of Engineers refuses to authorize further construction of Dakota Access Pipeline "
I am so sad that I have to follow lawful guidelines, but if I were a big multi millionaire corporation the laws do not effect me. Same laws for every one of us. I think that America has found their problem. Corporations are sucking us dry, and smiling while they do it. Screw the next generation, who cares?